Since I got an electric car, my power usage had gone up, and going solar was a way to offset the increased electricity cost. What interested you about going solar initially? Why do you support solar energy? Since I got an electric car, my power usage had gone up, and going solar was a way to offset the increased electricity cost. 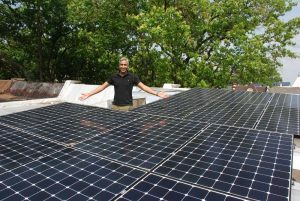 I have always been interested in using solar power — and renewable energy sources in general — because it reduces environmental pollution, has no carbon emissions, and uses fewer natural resources. Why did you choose to go solar with a solar co-op? What benefits did you experience going solar with a co-op? The solar co-op that was active in my area has provided a wealth of information about solar systems; the cost and financing options; and, most important, the net-metering and solar credits, which is a great incentive in D.C. metro area. My co-op, East of the River, also had special pricing with the installer, which helped reduce the system cost as well. Has anything surprised you about going solar? Many things: From the solar equipment point of view, I was surprised at how simple the system is and the efficiency at which it produces power. Net-metering and solar credits, particularly in D.C., help pay off the system in about 3-4 years. After that point, the system will become an additional source of income. Do you have any data on your solar system’s performance? What electricity savings have you seen since going solar? My solar system is about 4.5 kW in size and it produces, on average, about 25 KW on sunny summer days. On a monthly basis, it has produced about 300 KW in winter, and up to 700 KW in the summer. Typical townhouses like mine use an average 1,000 KW a month in summer, toward which the solar system can contribute about 70% cost saving. What advice would you give to someone who is considering going solar? I would advise anyone who is considering going solar to attend an educational session, read online materials and also calculate an ROI using sites like mapwell.com (https://www.mapdwell.com/en/solar/dc). An additional source of income, once the solar system is paid off.